The Sacred Page: Why Must the Messiah Die? Despite a few mysterious prophetic texts that seemed to intimate this possibility (e.g. Daniel 9:26), the idea that the Messiah could arrive and subsequently be killed was radically counter-intuitive to most first-century Jews. The Readings for today's Mass offer us two of the most poignant prophecies of the suffering of the Messiah. Isaiah 50:4-7, the First Reading, is part of one of the several enigmatic “servant songs” characteristic of the second part of Isaiah (Isaiah 40-66). (I follow Benjamin Sommer in seeing Isa 40-66 as a literary unit. I love his scholarship generally.) 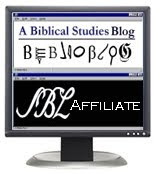 The subject of these “songs” or poems is a mysterious “Servant” of the Lord, who is described variously in the first, second and third person. The Responsorial Psalm is perhaps the most dramatic in the psalter, and has always been understood as a prophecy of the passion. Back to Psalm 22: this psalm is one of the most complete Todah psalms in the entire psalter. Excellent work on the Todah and its significance for the psalms has been done by Hartmut Gese , followed by Joseph Ratzinger , and summarized superbly by our own Michael Barber . Jesus cites Psalm 22 from the cross. The so-called “Cry of Dereliction,” (“My God, My God ...”) is, of course actually the first line of Psalm 22. The psalms in antiquity were almost certainly not known by their present numberings, because the numbering systems varied according to different editions of the psalter (for example, Qumran’s 1QPalmsa). The way to refer to a psalm was probably by its first line—a practice similar to the traditional Jewish naming of biblical books by their first words (also done in the Catholic tradition with Papal documents). With that in mind, fast forward to the end of Psalm 22. How does the Psalm end? In suffering, or ...? But ultimately that only backs the question up. Why would God inspire the prophets to predict this? Why was it in God's plan? There are many approaches to answer that question. One of the approaches has to take into account the fact of God's creating a world in which other personal agents are truly free--able to choose evil, able to choose against God and other persons and bring harm to others. If it were not possible for humans to choose evil, they would not be free: they would be pleasant robots. Yet, if God created a world in which evil were realizable but he spared himself ever experiencing it, it would give grounds to his opponents to accuse him of permitting others to experience what he would never suffer himself. But if Christ is the Messiah--in fact, the LORD himself--then we have no distant God who allows suffering only for others, but one who accepts it also himself, and transforms it; redeems it; makes it a way to new life. Thank you for this, Dr. Bergsma! in the mysterious providence of God, the Mother of Jesus, the Virgin Mary, played a special role. In meditating upon Ps. 22, Jesus must have seen his holy mother as the special locus of God's activity. It was her womb from which God took him. It was on her breasts that God kept Jesus safe. It was by the nourishment provided from her breasts that God made him grow. From his very birth, he must have thought, he was dedicated to God, a reference not only to his own willful obedience to the Father, but to that of his Mother, who brought him to the Temple to be circumcised on the eighth day, fully identifying him with God's covenant people, Israel. Jesus, although greater than a prophet, was a prophet, and prophets in Israel used symbolic actions to express the message that God had given them for Israel. If, indeed, Jesus was meditating on God's past faithfulness to him through his Mother, and if Jesus was meditating on and enacting the new future, in which Jew and Gentile alike would share in God's kingdom, it only makes sense to see Jesus as intentionally connecting his other great action from the Cross with these two themes. God, who had been faithful to him in the past through his Mother, would be faithful to him again through his Mother, by bringing, through her, many sons to glory (c.f. Heb 2:10). 1-the God of Israel, who theoretically needs nothing, still wants to be paid off in blood. 2-He had his prophets foretell the payment. 3-He got what he wanted in the death of Jesus. Great post! I am relating, as I am writing my paper right now on the liturgical backdrop to Hebrews and I am finding the todah throughout the Letter. You know Swetnam's work on chap. 13. Look at Psalm 118 (a todah psalm)quoted in 13:6 in the context of the whole chapter...very profound! @fact: You're not really getting the point of Christianity. Jesus is the God of Israel. He's paying the penalty himself, so that others don't have to. If Jesus isn't God (Arianism, etc.) then your point is valid. If he is, than it's not. 1. Regardless of whether He needs anything, we still owe Him. A king may not need the help of his avowed soldier, but if that soldier flees, he nonetheless has violated his vow, and owes reparation. Further, it is for our good, not just for God's glory, that this debt be paid. As long as it was owed, humanity was in a state of injustice and lacked integrity. Our owing Him, and our being unjust, do not in any way reflect badly on Him. 2. Yes, because He loves us, He wants us to be aware of the cost of our sins. Nonetheless, most failed to get the message. 3. If by "what He wanted," you mean "to manifest His great love and mercy by willingly taking on the weight of sin Himself and suffering at the hands of sinners to make atonement for sin and offer salvation and justification to all men, as well as to provide a model of radical fulfillment of divine will by trust in the Heavenly Father," then I suppose I have no argument. It would be ridiculous, though, in light of the full Christian understanding of the Passion, to paint God as some blood-thirsty hate-monger who was satisfied by the death of His own Son. No, He was owed something by us because we are blood-thirsty ourselves in our sinfulness, because we are hate-mongers, and in our sinfulness, He still chose to love us. To attribute hate or blood-thirst to God would be preposterous. We're the reason anything is owed; that's not God's fault. On the contrary, He has done nothing but love us to the end. 4. The people were murdering an innocent man, not to appease God, but because of envy. 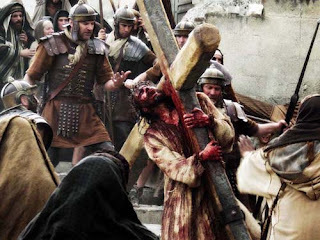 Yet this God whom they crucified, whom you call bloodthirsty, offered Hisown blood for them and called on His Father to forgive them from the Cross. How wonderful to find this blog and, in particular, this post. I am not as erudite as the author and, I fear, my comment may seem trivial but I will plow ahead none the less. I have always felt that when Jesus cried out the words from Psalm 22 it would have been abundantly clear to those listening that he intended them to think through to the rest of the psalm. As a child those words, spoken by Jesus, frightened me to the core. I knew The Father loved His Son -- more than we could ever understand. My parents told me that God loved me more than even they could (and I knew they loved me with all of their hearts). So, (I used to think) why would God abandon His Son -- and if He really did abandon Jesus what chance did I have. My parents must have somehow calmed my fears because I grew up trusting God to the depths of my being. But . . . . every time this reading came up I used to feel panicked inside. I felt sure that, just like when we start nursery rhymes with our kids and they know the rest . . . that the people hearing Jesus knew the psalms (no Bibles back then - oral tradition). Even if I am wrong -- I felt that God wanted to reassure me (and anyone else who felt panic at those words). I am not a Bible scholar but I know enough to realize that He has us all in the palm of his hands and he knows every hair on our heads and we just need to trust Him and follow Him. Your post was most edifying! I am going to share it with my kids and keep coming back for more! These are just some examples but I believe it is very telling about why the Messiah must die. I believe that since the Antichrist had to come anyway,which was the real reason for Lucifer's rebel in order to become man himself since he possessed all what he wanted,and keep all the souls and kingdom for eternity,he failed in his first attempt and Jesus destroyed true his death instead. Now he is working to vindicate himself when he comes in the near future.Jesus was murdered because the Jews taught that He was Satan's Son the Antichrist.The bible started this battle when Chain killed Abel which it is quite obvious that Satan realized that Jesus will be born definitely through Abel. God allowed this to happen as a prophecy that Jesus will be killed by mistake by Satan himself, and through that killing, which was Satan's favourite job,He kills himself. Very well said!!! People like you make me proud to be a Catholic. Thank you and God Bless! @Charles, where in the Bible does it say that Satan wants to become man? The Tradition of the Church is that his sin was pride. Why would a prideful angel want to become man, a lower creature? No, he hates humanity because he hates God, and like any terrorist whose enemy is invincible, he attacks the children and tarnishes the image of that enemy. The Antichrist is not Satan. He is a human only by nature, a vessel for demonic possession, yes, but not a devil himself. I love your post Dr Bergsma. The salvation of man has been the sole pursuit of man through the ages. God has created man out of Love n has condemned him out of Justice. Since from the beginning it wasn't God's intention for man to die and it was the sin of man that has brought him death and separated him from God, God in His infinite Mercy had decided to redeem man cos man couldn't save himself. Here comes the need for a Messiah. The purpose of this Messiah was to restore the Life which man has lost through sin, n to do this, He must conquer death( which came from satan), n since Lucifer was the highest angel in heaven before his fall, no angel could pay the price but someone who is greater than him and that is God( Jesus )Himself.And that is why He must conquer death by His own death by rising from the death and restoring life(eternal) back to man.